• SOUTH COAST COLLEGE in ORANGE, CALIFORNIA is hosting PACK THE SCHOOL, a career event/open house on SATURDAY, DECEMBER 12TH from 10 A.M. to 12 P.M. to introduce our community to the different fields of study that we offer at our college. • Come listen to WORKING PROFESSIONALS talk about COURT REPORTING, CAPTIONING, CART REPORTING, PARALEGAL, and MEDICAL ASSISTING! 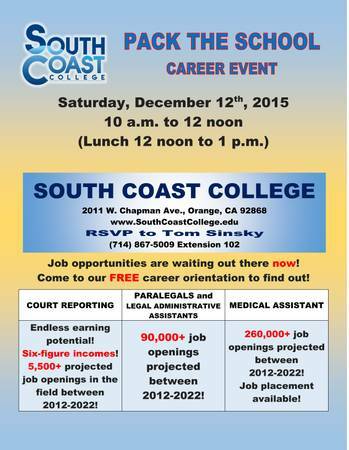 THIS SATURDAY, DECEMBER 12, 2015, FROM 10:00 A.M. TO 12:00 P.M.
FINANCIAL AID IS AVAILABLE FOR THOSE WHO QUALIFY!